I've wanted to document the stuff I've taken on this hike up the PCT... or rather, the stuff I've ended up with. I've taken full advantage of the USPS and sent a fair bit home as I've hiked north, and bought a few new things along the way. Some things have worked out well from the start, other things just weren't good at all and I went through some changeouts to get things right for me and my needs. 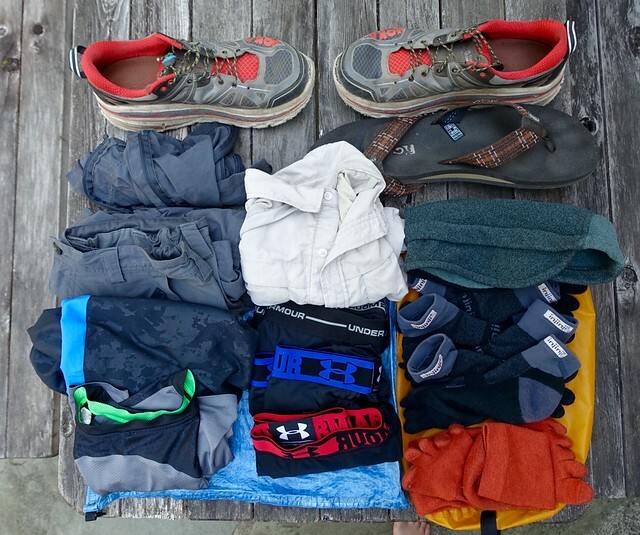 For this first post, I'll look at what I carried with clothing and outerwear--just any 'garment' that I would take along on the trail. Since I was going on the PCT early, I wanted to take enough to be warm (I hate cold) but not so much that it would weigh me down. Here's what I ended up with on the last part of the trail for clothing in particular. That's it. Let's go through the picture. Shoes: Hoka Stinson 3, top of picture. Expensive, highly cushioned, highly rigid trail runners. I tried Brooks Cascadia 9's (poor support, the shoe is mighty flexible), Altra Lone Peak 2.0's (wide but short toe box with not much height, my big toenail was bruised after 5 miles), Altra Olympus 1.5's (same issue with the Lone Peaks), Vasque Breeze hiking boots (just too heavy and they don't dry out overnight or breathe well.) Used Superfeet Copper insoles but probably could get by with just the newer plusher Ortholite inserts. Used Stinson 2 ATRs until Ashland Oregon. I do not use gaiters and think they're just additional hassle and weight; I don't know why people think they're necessary. The Stinson ATRs last at most 450 miles, and give out when the foam compresses to the point that my foot sinks so deeply into the upper that my anklebone starts rubbing. The uppers are generally not worn out at that point. Flipflops/camp shoes: Teva Mush sandals, upper right in the picture. I didn't start out with camp shoes--they're a luxury, I thought!--then I got tired of fording streams in the Sierra in my Hokas, and walking for miles in wet shoes. I bought 'water shoes' at the Rite Aid in Mammoth for $7.99, which were heavy and didn't dry well and got dirt inside their thin neoprene that rubbed my feet raw, but I started enjoying them in camp. I ditched them in Tahoe and bought Teva back-strap sandals for fording streams, which were kinda heavy. Hiking buddy Sage ended up wearing those sandals for hiking a bit, so I gave them to him and bought these lightweight flipflops instead. I love them--not only do I wear them around camp or in town, but also when I take off my shoes and socks during lunch to let my feet breathe a bit. They're also pretty light wight, weighing in at just 100g per flipflop. Sleeping/warm cap: Kathmandu fleece cap with sides, right side of picture. Got this in 2002 at the store near Sydney Town Hall, and I still use it. At night I pull it down over my eyes so I can sleep, and fold the flaps down over my ears and neck to stay warm. It can also make a warm touque if it's not too cold out. It's also good for hiking in temperatures around freezing, though above 40F/5C I switch to my Tilley mesh hat. Socks, hiking: Injinji Performance 2.0 Running Midweight toe socks, 3 pair. Right side in the picture. These are great, the little toe fingers really do prevent blisters. I tried Darn Tough socks for a few hundred miles and they gave me blisters between my pinky and 'ring' toe; I really wanted to like them. Injinji makes a fair number of complicated socks, their product lineup is a bit confusing. I carry three pairs and age them out when I buy a new pair of shoes, they last only 400 to 400 miles. I really like them, though they do take a long time to air dry when wet. I take three pair so at least one pair is usually dry. Socks, sleeping: Montbell crew-length Wickron toe socks (the orange socks in the picture, lower right). I put these on at night to prevent my dirty disgusting feet and lower legs from skanking up the sleeping bag--not every campsite has water, and though I do rinse my feet pretty much every night it doesn't mean they're clean. These socks keep my feet warm by not sweaty, and cool if it's hot out. They dry very quickly too. Long sleeve shirt: Beige REI Sahara Tech Shirt. Middle column of the picture. Dries quickly, prevents rubbing of my backpack. I unbutton the front of the shirt when its warm out to let the breeze evaporate the sweat off my chest and belly without exposing my skin to the sun. I also lower the sleeves if it's warm out, and leave them unbuttoned, that makes a nice sunshade on my forearms while still allowing air circulation as I walk. I'm really a small size now after losing weight on the PCT, but keep using the medium because it makes a little billowy effect that dries the sweat more quickly. I started out with the white version of this shirt, but white showed the dirt more and the pack made stains on it, so I went with beige. I'll still use the white for weekend trips when I'm done with the PCT. Undies: Underarmour Heat Gear, one Boxerjock 6" Medium and two compression medium. This was tedious to get right, but the big thing I wanted to avoid was that raw thigh chafing on the insides of my thighs. At first I went for the Boxerjocks (and some similar REI Boxerjacks shorts), but the seams cut into the crease between my legs and my balls... thank the gods I brought diaper rash ointment. The extra fabric in the Boxerjocks can also gather up in that crease, ugh, and get all wet with sweat and cause even more chafing. I changed out to compression shorts that I got at an athletic supply shop and not 'undies' and their tightness and lack of seams prevented both the bunching and the creasing effect. The Underarmour compression shorts are now my preferred hiking undies. Pants: REI Sahara Tech convertible pants, medium. These are pretty good, and come in five colors, I would've choose some medium color like an olive green or a dark tan but for my inseam length of 28" they only come in two colors, beige and 'asphalt', grrrr, so I got asphalt which is more the color of PCT mud. I wore the legs for much of southern California because it was dry and mild, and that kept the dirt and dust off my legs, and let me slide through a few overgrown sections without getting all scratched up. The legs were also great for the Sierra snow and cold breezy weather in the day. After it got warm (around Tahoe) I haven't put the legs on since. I like that there's both a zippered cargo pocket for when I don't want to lose things (my 'wallet') and a velcro-fastened one. I usually end up putting all my snack packaging, like used Clif bar wrappers, empty Skittles bags, and string cheese sleeves, in the right front velcro cargo pocket. T-Shirt: Underarmour Heat Gear gray and black and green T. This is good for laundry day, for going out in town, and most especially for sleeping after a sticky sweaty day. I started out with a kinda dumpy Underarmour t-shirt, but this looks better and weighs less. You can save ounces by choosing a different T-shirt--this one weighs 120 grams, and my older Underarmour T-shirt weighs 170 grams. That's about two ounces. It can also act as a layer underneath the long sleeved shirt, and dries really quickly. Running Shorts: Underarmour running shorts with pockets (picture lower left). I didn't think these would be that useful but they were. I wore them around camp, while doing laundry, for sleeping, even in town. I wanted to wear them hiking, but found the elastic bunched up waistband kinda dug into my skin, compressed by the backpack's hip belt, so I only wore them hiking for one morning. Pockets are pretty much mandatory, too, as well as quick-drying ability. Clothing sack: Sea To Summit 9 liter sack, gold colored (under the clothes on the right of the picture). All of this gets stuffed into a gold sack, then packed low in my pack, generally on top of the sleeping bag. The gold color says "clothing", it's an arbitrary choice, and distinguishes the clothing sack from the dark blue camping sack and the green 'good-to-go' sack. That's it. Next up will be pictures of the outerwear I took on the PCT: the two jackets, midlayer, gloves, hat, bandana, and rain kilt.